For the children's novel by Kate Douglas Wiggin, see Rebecca of Sunnybrook Farm. While working as the companion to a rich American woman on holiday in Monte Carlo, the unnamed narrator, a naïve young woman in her early 20s, becomes acquainted with a wealthy Englishman, George Fortescue Maximilian "Maxim" de Winter, a 42-year-old widower. After a fortnight of courtship, she agrees to marry him and, after the wedding and honeymoon, accompanies him to his mansion in Cornwall, the beautiful estate Manderley. Mrs Danvers, the sinister housekeeper, was profoundly devoted to the first Mrs de Winter, Rebecca, who died in a boating accident about a year before Maxim and the second Mrs de Winter met. She continually attempts to undermine the new Mrs de Winter psychologically, subtly suggesting to her that she will never attain the beauty, urbanity, and charm her predecessor possessed. Whenever the new Mrs de Winter attempts to make changes at Manderley, Mrs Danvers describes how Rebecca ran it when she was alive. Each time Mrs Danvers does this, she implies that the new Mrs de Winter lacks the experience and knowledge necessary for running an important estate. Cowed by Mrs Danvers' imposing manner, and the other members of West Country society's unwavering reverence for Rebecca, the new mistress becomes isolated. She is soon convinced that Maxim regrets his impetuous decision to marry her and is still deeply in love with the seemingly perfect Rebecca. The climax occurs at Manderley's annual costume ball. Mrs Danvers manipulates the protagonist into wearing a replica of the dress shown in a portrait of one of the former inhabitants of the house—hiding the fact that the same costume was worn by Rebecca to much acclaim shortly before her death. The narrator has a drummer announce her entrance using the name of the lady in the portrait: Caroline de Winter. When the narrator shows Maxim the dress, he gets very angry at her and orders her to change. Shortly after the ball, Mrs Danvers reveals her contempt for the second Mrs de Winter, believing she is trying to replace Rebecca, and reveals her deep, unhealthy obsession with the dead woman. Mrs Danvers tries to get Mrs de Winter to commit suicide by encouraging her to jump out of the window. However, she is thwarted at the last moment by the disturbance occasioned by a nearby shipwreck. A diver investigating the condition of the wrecked ship's hull also discovers the remains of Rebecca's sailing boat, with her decomposed body still on board. This discovery causes Maxim to confess the truth to the second Mrs de Winter. He tells her how his marriage to Rebecca was nothing but a sham: how from the very first days husband and wife loathed each other. Rebecca, Maxim reveals, was a cruel and selfish woman who manipulated everyone around her into believing her to be the perfect wife and a paragon of virtue. She repeatedly taunted Maxim with sordid tales of her numerous love affairs. The night of her death, she told Maxim that she was pregnant with another man's child, which she would raise under the pretense that it was Maxim's and he would be powerless to stop her. In a rage, he had shot her through the heart, then disposed of her body by placing it in her boat and sinking it at sea. The second Mrs de Winter thinks little of Maxim's murder confession, but instead is relieved to hear that Maxim has always loved her and never Rebecca. Rebecca's boat is raised and it is discovered that it was deliberately sunk. An inquest brings a verdict of suicide. However, Rebecca's first cousin, and lover, Jack Favell, attempts to blackmail Maxim, claiming to have proof that Rebecca could not have intended suicide based on a note she sent to him the night she died. It is revealed that Rebecca had had an appointment with a Doctor Baker in London shortly before her death, presumably to confirm her pregnancy. When the doctor is found, he reveals that Rebecca had been suffering from cancer and would have died within a few months. Furthermore, due to the malformation of her uterus, she could never have been pregnant. Maxim assumes that Rebecca, knowing that she was going to die, manipulated him into killing her quickly. Mrs Danvers had said after the inquiry that Rebecca feared nothing except dying a lingering death. Maxim feels a great sense of foreboding, and insists on driving through the night to return to Manderley. However, before he comes in sight of the house, it is clear from a glow on the horizon and wind-borne ashes that it is ablaze. The Narrator/the Second Mrs de Winter: A timid, naïve, middle-class woman in her early twenties, who enjoys sketching. Neither the narrator's first nor maiden name is revealed. She is referred to as "my wife", Mrs de Winter, "my dear", and so on. The one time she is introduced with a name is during a fancy dress ball, in which she dresses as a de Winter ancestor and is introduced as "Caroline de Winter", although this is clearly not her own name. She signs her name as "Mrs M. de Winter", using Maxim's initial. Early in the novel she receives a letter and remarks that her name was correctly spelled, which is "an unusual thing," suggesting her name is uncommon, foreign or complex. While courting her, Maxim compliments her on her "lovely and unusual name". Despite her timidity, she gradually matures throughout the novel, refusing to be a victim of Rebecca's phantom-like influence any longer and becoming a strong, assertive woman in her own right. George Fortescue Maximilian "Maxim" de Winter: The reserved, unemotional owner of Manderley. He marries his new wife after a brief courtship, yet displays little affection toward her after the marriage. Emotionally scarred by his traumatic marriage to Rebecca, his distance toward his new wife causes her to fear he regrets his marriage to her and is still broken-hearted over Rebecca's death. Maxim killed Rebecca in a blind rage after she pushed him over the edge with her lie that she was carrying the child of one of her lovers and would force him to raise it as his own. He does eventually reveal to his new wife that he does love her, but not until several months of marriage have passed. His full name is tauntingly revealed, by Jack Favell, to be George Fortescue Maximilian de Winter. Mrs Danvers: The cold, creepy, overbearing housekeeper of Manderley. Danvers was Rebecca's family maid when she was a child and has lived with her for years. She is unhealthily obsessed with Rebecca and preserving Rebecca's memory. She resents the new Mrs de Winter, convinced she is trying to "take Rebecca's place". She tries to destroy the marriage, but her efforts fail and only serve to bring Maxim and his new wife closer together. After her scheme is ruined, Mrs Danvers apparently burns Manderley to the ground, preferring to destroy it than allow Maxim to share his home with another lover and wife. She is nicknamed Danny which is derived from her last name; her first name being unknown or unimportant, but in Sally Beauman's sequel Rebecca's Tale it was said to be Edith. Rebecca de Winter: The unseen, deceased titular character, who has been dead for less than a year. A famous beauty, and on the surface a devoted wife and perfect hostess, Rebecca was actually a compulsive liar and an openly promiscuous woman who tormented her husband Maxim with lurid tales of her nonstop affairs. Her lingering presence overwhelms Manderley, dominating the visitors, the staff and the new Mrs de Winter. Through dialogue, it is slowly revealed that Rebecca possessed all the signs of a psychopath: habitual lying, superficial charm, expert manipulation, no conscience and no remorse. She was also revealed to be somewhat sadistic—Danvers tells a story of Rebecca, during her teenage years, cruelly whipping a horse until it bled. In the 1940 film adaptation, her maiden name was said to be Hildreth. Frank Crawley: The hard-working, dutiful agent of Manderley. He is said to be Maxim's trusted advisor and faithful confidant. He soon becomes a good friend to the second Mrs de Winter, and helps her in the self-doubt of her inability to rule Manderley as its mistress. Beatrice Lacy (formerly de Winter): Maxim's wilful and quick-witted sister, who develops an immediate fondness for the new Mrs de Winter. Prior to the novel, she had married Giles Lacy. She, along with her brother, is one of the few people who knew Rebecca's true, vile nature, and was one of her victims: Beatrice's husband was seduced by her. Giles Lacy: The slightly slow-witted husband of Beatrice and Maxim's brother-in-law. He was one of the many men who fell for Rebecca's charms. Frith: The middle-aged, kind and devoted butler at Manderley. He had worked for the de Winters when Maxim's late father was a boy. Clarice: Mrs de Winter's faithful and trusted maid. She aided her lady and mistress in fitting her white, frilly gown for the fancy dress ball. She replaces the original maid, Alice, later on. Jack Favell: The crafty and sneaky first cousin of the late Rebecca de Winter and her most frequent "supposed boyfriend/lover". He and Rebecca had grown up together as children, causing mayhem, and he shares many of her worst traits, suggesting insanity runs in their family. He is strongly disliked by Maxim and several other characters. Since Rebecca's untimely demise, his one and only true friend and confidante is Mrs Danvers, whom he calls "Danny", just as Rebecca had done. Colonel Julyan: The investigator of the inquest of the true cause of Rebecca's untimely demise. Dr Baker: A doctor who specialises in the feminine problems of women. A few hours prior to her death, Rebecca went to see him in secret, when he diagnosed her with an unspecified type of cancer. The fictional Manderley, a country estate which du Maurier's editor noted "is as much an atmosphere as a tangible erection of stones and mortar"
In 1937, Daphne du Maurier signed a three-book deal with Victor Gollancz and accepted an advance of £1,000. A 2008 article in The Daily Telegraph indicates she had been toying with the theme of jealousy for the five years since her marriage in 1932. She started "sluggishly" and wrote a desperate apology to Gollancz: "The first 15,000 words I tore up in disgust and this literary miscarriage has cast me down rather." Her husband, Tommy "Boy" Browning, was Lieutenant Colonel of the Grenadier Guards and they were posted to Alexandria, Egypt, with the Second Battalion, leaving Britain on 30 July 1937. Gollancz expected her manuscript on their return to Britain in December but she wrote that she was "ashamed to tell you that progress is slow on the new novel....There is little likelihood of my bringing back a finished manuscript in December." On returning to Britain in December 1937, du Maurier decided to spend Christmas away from her family to write the book and she successfully delivered it to her publisher less than four months later. Du Maurier described the plot as "a sinister tale about a woman who marries a widower....Psychological and rather macabre." Some commentators have noted parallels with Charlotte Brontë's Jane Eyre. Another of du Maurier's works, Jamaica Inn, is also linked to one of the Brontë sisters' works, Emily's Wuthering Heights. Du Maurier commented publicly in her lifetime that the book was based on her own memories of Menabilly and Cornwall, as well as her relationship with her father. While du Maurier "categorised Rebecca as a study in jealousy... she admitted its origins in her own life to few." Her husband had been "engaged before – to glamorous, dark-haired Jan Ricardo. The suspicion that Tommy remained attracted to Ricardo haunted Daphne." In The Rebecca Notebook of 1981, du Maurier "'remembered' Rebecca's gestation … Seeds began to drop. A beautiful home... a first wife... jealousy, a wreck, perhaps at sea, near to the house... But something terrible would have to happen, I did not know what..." She wrote in her notes prior to writing: 'I want to build up the character of the first [wife] in the mind of the second... until wife 2 is haunted day and night... a tragedy is looming very close and CRASH! BANG! something happens.'" Du Maurier and her husband, "Tommy Browning, like Rebecca and Maximilian de Winter, were not faithful to one another." Subsequent to the novel's publication, "Jan Ricardo, tragically, died during the Second World War. She threw herself under a train." Childhood visits to Milton Hall, Cambridgeshire (then in Northamptonshire) home of the Wentworth-Fitzwilliam family, may have influenced the descriptions of Manderley. The famous opening line of the book "Last night I dreamt I went to Manderley again." is an iambic hexameter. The last line of the book "And the ashes blew towards us with the salt wind from the sea" is also in metrical form; almost but not quite an anapestic tetrameter. Shortly after Rebecca was published in Brazil, critic Álvaro Lins pointed out many resemblances between du Maurier's book and the work of Brazilian writer Carolina Nabuco. Nabuco's A Sucessora (The Successor) has a main plot similar to Rebecca, for example a young woman marrying a widower and the strange presence of the first wife – plot features also shared with the far older Jane Eyre. Nina Auerbach alleged in her book, Daphne du Maurier, Haunted Heiress, that du Maurier read the Brazilian book when the first drafts were sent to be published in England and based her famous best-seller on it. According to Nabuco's autobiography, Eight Decades, she (Nabuco) refused to sign a contract brought to her by a United Artists' representative in which she agreed that the similarities between her book and the movie were mere coincidence. Du Maurier denied copying Nabuco's book, as did her publisher, claiming that the plot used in Rebecca was quite common. A further, ironic complication in Nabuco's allegations is the similarity between her novel and the novel Encarnação, written by José de Alencar, Brazil's most celebrated novelist of the nineteenth century, and published posthumously in 1873. In 1944 in the United States, du Maurier, her US publishers, Doubleday, and various parties connected with the 1940 film version of the novel, were sued for plagiarism by Edwina L. MacDonald who alleged that du Maurier had copied her novel Blind Windows. Du Maurier successfully rebutted the allegations. Du Maurier delivered the manuscript to her publisher, Victor Gollancz, in April 1938. On receipt, the book was read in Gollancz's office and her "editor, Norman Collins, reported simply: 'The new Daphne du Maurier contains everything that the public could want.'" Gollancz's "reaction to Rebecca was relief and jubilation" and "a 'rollicking success' was predicted by him." He "did not hang around" and "ordered a first print run of 20,000 copies and within a month Rebecca had sold more than twice that number." The novel has been continuously in print since 1938 and in 1993 "du Maurier's US publishers Avon estimated ongoing monthly paperback sales of Rebecca at more than 4,000 copies." Du Maurier "did several radio interviews with BBC and other stations" and "attended Foyle's Literary Lunch" in August 1938 while Good Housekeeping, Ladies Home Journal, and House & Garden published articles on du Maurier. The Times said that "the material is of the humblest...nothing in this is beyond the novelette." In the Christian Science Monitor of 14 September 1938, V. S. Pritchett predicted the novel "would be here today, gone tomorrow." Few critics saw in the novel what the author wanted them to see: the exploration of the relationship between a man who is powerful and a woman who is not. Rebecca is listed in the 20th-Century American Bestsellers descriptive bibliography database maintained by the University of Illinois. The entry, by Katherine Huber, provided the detailed information on the English and American editions as well as translations listed below. 29 subsequent editions Between 1939–1993 Doubleday Doran and Company, Inc.
1940 Garden City Publishing Co.
Persian 1980 Rebecca Iran: Amir Kabir Printing Co.
Hungarian Ruzitska Mária A Manderley ház asszonya Singer és Wolfner Irodalmi Intézet Rt. 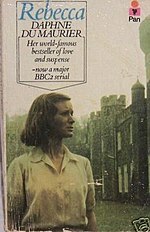 In the US, du Maurier won the National Book Award for favourite novel of 1938, voted by members of the American Booksellers Association. In 2003, the novel was listed at number 14 on the UK survey The Big Read. In 2017, it was voted the UK's favourite book of the past 225 years in a poll by bookseller W H Smith. Other novels in the shortlist were To Kill a Mockingbird by Harper Lee, Pride and Prejudice by Jane Austen, Jane Eyre by Charlotte Bronte, and 1984 by George Orwell. Rebecca has been adapted several times. The best known of these is the Academy Award winning 1940 Alfred Hitchcock film version Rebecca, the first film Hitchcock made under his contract with David O. Selznick. The film, which starred Sir Laurence Olivier as Max, Joan Fontaine as the heroine, and Dame Judith Anderson as Mrs Danvers, was based on the novel. However, the Hollywood Production Code required that if Max had murdered his wife, he would have to be punished for his crime. Therefore, the key turning point of the novel – the revelation that Max, in fact, murdered Rebecca – was altered so that it seemed as if Rebecca's death was accidental. At the end of the film version, Mrs Danvers perishes in the fire, which she had started. The film quickly became a classic and, at the time, was a major technical achievement in film-making. The 1964 Bollywood Hindi movie Kohra and 2008 movie Anamika were inspired by Rebecca. Pakistani drama Noor Pur Ki Rani was also inspired by Rebecca. The alterations were made as per the cultural traits. The drama was much appreciated as an attempt to enlighten many aspects of human nature. This drama was aired in the year 2009 on Pakistani drama channel Hum tv . In 2012, DreamWorks was working on a new adaptation of Rebecca. The script was expected to be written by Steven Knight. In 2018, it was reported that Netflix would be creating a new feature film adaption of the novel, which would be directed by Ben Wheatley, and written by Jane Goldman, starring Lily James and Armie Hammer. Rebecca has been adapted for television both by the BBC and by Carlton Television. The 1979 BBC version starred Jeremy Brett as Maxim, Joanna David as the second Mrs de Winter, and Anna Massey (Jeremy Brett's former wife) as Mrs Danvers. It was broadcast in the United States on PBS as part of its Mystery! series. The 1997 Carlton production starred Emilia Fox, Joanna David's daughter, in the same role played by her mother in 1979; Charles Dance as de Winter, and Dame Diana Rigg as Mrs Danvers. It was broadcast in the United States by PBS as part of its Masterpiece Theatre series. The latter adaptation is noteworthy for featuring an appearance by Rebecca, played by Lucy Cohu. It also shows Maxim saving Mrs Danvers from the fire; and finishes with an epilogue showing Maxim and the second Mrs de Winter relaxing abroad, as she explains what she and Maxim do with their days now they are unlikely ever to return to Manderley. Episode five, series two of the British sketch comedy That Mitchell and Webb Look features a parody of the 1940 film-adaptation of the novel, presented as an early cut of the same. According to the sketch, producer Selznick initially insisted, against director Hitchcock's instructions, that the film contain "a dame called Rebecca." The movie consists of Maxim bringing Rebecca to a Manderley whose master, his servants, and guests constantly remind the first wife of her inferiority to an as-yet-undetermined "second Mrs de Winter". Du Maurier herself adapted Rebecca as a stage play in 1939; it had a successful London run in 1940 of over 350 performances. The Talking Books for the blind edition read by Barbara Caruso borrows heavily from this stage adaptation which differs materially from the novel in many respects including changing the iconic ending of the novel. On 28 September 2006 a musical version of Rebecca premièred at the Raimund Theater in Vienna, Austria. The new musical was written by Michael Kunze (book and lyrics) and Sylvester Levay (music) and directed by the American director Francesca Zambello. The cast includes Uwe Kröger as Max de Winter, Wietske van Tongeren as "Ich" ("I", the narrator) and Susan Rigvava-Dumas as Mrs Danvers. Before 2008 there was talk of moving the musical to the Broadway stage, but the original plans were cancelled due to the complexity of the sets, scenery, and special effects – including a grand staircase that twirls down into the stage and a finale in which the entire stage – including Mrs Danvers – is engulfed in flames. The musical was scheduled to open on Broadway on 18 November 2012, with Jill Paice as "I", Ryan Silverman as Max de Winter, and Karen Mason as Mrs Danvers, but funding difficulties led to last-minute cancellation. In 2015, Emma Rice of Kneehigh Theatre in Cornwall adapted Rebecca for the stage. Rebecca was adapted as an opera with music by Wilfred Josephs, premiered by Opera North in Leeds, England, 15 October 1983. Rebecca's Tale (2001), by Sally Beauman (ISBN 978-0-06-621108-4) is a sequel – a narrative of four characters affected by Rebecca. While it has been mistakenly referred to as a prequel, the story includes sections that are prequel material in narrative. Hill, Susan (1993) [written in the 1980s], Mrs de Winter (sequel), ISBN 978-0-09-928478-9 . One edition of the book was used by the Germans in World War II as the key to a book code. Sentences would be made using single words in the book, referred to by page number, line and position in the line. One copy was kept at Rommel's headquarters, and the other was carried by German Abwehr agents infiltrated into Cairo after crossing Egypt by car, guided by Count László Almásy. This code was never used, however, because the radio section of the HQ was captured in a skirmish and hence the Germans suspected that the code was compromised. This use of the book is referred to in Ken Follett's novel The Key to Rebecca – where a (fictional) spy does use it to pass critical information to Rommel. This use of the novel was also referred to in Michael Ondaatje's novel The English Patient. The novel, and the character of Mrs. Danvers in particular, have entered many aspects of popular culture. The character of Mrs Danvers is alluded to numerous times throughout Stephen King's Bag of Bones. In the book, Mrs Danvers serves as something of a bogeyman for the main character Mike Noonan. King also uses the character name for the chilly, obedient servant in "Father's Day," a tale in his 1982 film Creepshow. In Jasper Fforde's Thursday Next series, in the bookworld, they have accidentally made thousands of Mrs Danvers clones, which they use as troops against The Mispeling Vyrus and other threats. In The Maxx issue No. 31, a teenage Julie Winters watches a black-and-white version of the movie. In Fifty Shades Darker by E.L. James, Anastasia Steele reads "Rebecca" after an argument with Christian Grey. Anastasia is haunted by Christian's previous relationships with his "submissives" and like the second Mrs de Winters, is fearful she doesn't measure up. In Danielle Steel's novel Vanished, it is mentioned that the main character is reading Rebecca. This was most likely deliberate on Steele's part, considering that the novel has many of the same elements as Rebecca. In Nimra Ahmed's "Namal" Faris Ghazi and His second wife Zumar were dining out for the first time since their marriage when Faris begin to talk about his former wife (now dead) and he indirectly ends up declaring his love for her. Zumar sits there speechless before she leaves the restaurant without touching her dinner. While Faris was talking about Zartasha, Nimra described the situation with "suddenly the smell of Rebecca de Winters was all around"
The 1983 science fiction comedy film The Man with Two Brains gives a brief nod to aspects of Rebecca. After falling for Dolores Benedict, Dr Hfuhruhurr (Steve Martin) intends to marry her and seeks a sign from the portrait of his deceased wife, Rebecca. The supernatural reaction of the portrait doesn't convince him and so he places her in a cupboard. The fifth episode of the second series of That Mitchell and Webb Look contains an extended sketch parodying the 1940 film, in which Rebecca is unable to live up to Maxim's and Mrs Danvers's expectations for the Second Mrs de Winter – described as "TBA". The plots of certain Latin-American soap operas have also been inspired by this story, such as Manuela (Argentina), Infierno en el paraíso (Mexico), the Venezuelan telenovela Julia and its remake El Fantasma de Elena on Telemundo. On an episode of The Carol Burnett Show, the cast did a parody of the film titled "Rebecky", with Carol Burnett as the heroine, Daphne; Harvey Korman as Max "de Wintry" and in the guise of Mother Marcus as Rebecky de Wintry; and Vicki Lawrence as Mrs Dampers. The story was again referenced in an episode of the series "Mama's Family" (a spinoff of the Burnett show) titled "I Do, I Don't." In it, Bubba, Iola, and Mama each have nightmares about married life. Mama's dream is a parody of the Rebecca scenario. In 1986, an episode of The Comic Strip called "Consuela" parodied Rebecca. It was written by French and Saunders, and starred Dawn French as the maid and Jennifer Saunders as the new wife of Adrian Edmondson. In Pakistan, Rebecca was produced as an Urdu serial television drama, Noorpur Ki Rani (Queen of Noorpur), and it was a hit with audiences in Pakistan and India. In the episode Eloise from "The Sopranos", Carmella Soprano, while at lunch with her daughter Meadow, speaks disapprovingly of Meadow's relationship with her boyfriend, saying that they "hang on each other", to which Meadow replies "Excuse me, Mrs. Danvers, what do you have against love?" Meg & Dia's Meg Frampton penned a song entitled "Rebecca", inspired by the novel. Kansas alumnus Steve Walsh's solo recording Glossolalia includes a song entitled "Rebecca", with lyrics seemingly composed from Maxim de Winter's point of view: "I suppose I was the lucky one, returning like a wayward son to Manderley, I'd never be the same...". Steve Hackett included a song entitled "Rebecca," inspired by the novel, on his album To Watch the Storms. In 2013, Devon watchmakers Du Maurier Watches, founded by the grandson of Daphne du Maurier, released a limited edition collection of two watches inspired by the characters from the novel – The Rebecca and The Maxim. ^ Charles L.P. Silet. "Daphne DuMaurier's Rebecca". The Strand Magazine. ^ a b c d e f g h i j k l m n o p q Dennison, Matthew (19 April 2008), "How Daphne Du Maurier Wrote Rebecca", The Telegraph, archived from the original on 27 February 2018 . ^ Yardley, Jonathan (16 March 2004). "Du Maurier's 'Rebecca,' A Worthy 'Eyre' Apparent". The Washington Post. Archived from the original on 8 June 2012. Retrieved 12 December 2006. ^ "Presence of Orson Welles in Robert Stevenson's Jane Eyre (1944)". Literature Film Quarterly. Archived from the original on 24 January 2007. ^ "Bull's-Eye for Bovarys". Time. 2 February 1942. Archived from the original on 27 January 2012. Retrieved 26 October 2007. ^ "Milton Park and the Fitzwilliam Family" (PDF). Five Villages, Their People and Places: A History of the Villages of Castor, Ailsworth, Marholm with Milton, Upton and Sutton. p. 230. Archived (PDF) from the original on 16 October 2007. Retrieved 28 February 2010. ^ Lins, Álvaro (1941), Jornal de crítica [Journal of criticism] (in Portuguese), BR: José Olympio, pp. 234–36 . ^ "Tiger in a Lifeboat, Panther in a Lifeboat: A Furor Over a Novel", The New York Times, 6 November 2002, archived from the original on 23 July 2010 . ^ Souza, Daniel Nolasco; Borges, Valdeci Rezende (2006). "Intertextualidade em Encarnação de José de Alencar e A Sucessora, de Carolina Nabuco" (PDF). Anais eletrônicos do XIV Seminário de Iniciação Científica (in Portuguese). ^ Beauman, Sally (2003), "Introduction", Rebecca, London: Virago . ^ Huber, Katherine, "Du Maurier, Daphne: Rebecca", 20th-Century American Bestsellers, University of Illinois, archived from the original on 16 December 2013, retrieved 4 July 2013 . ^ Forster, Margaret, Daphne du Maurier . ^ Du Maurier, Daphne; Romanowicz-Podoska, Eleonora (10 May 2018). "Rebeka". "Iskry" – via alpha.bn.org.pl Library Catalog. ^ "Book About Plants Receives Award: Dr. Fairchild's 'Garden' Work Cited by Booksellers", The New York Times, ProQuest Historical Newspapers 1851–2007, p. 20, 15 February 1939, Du Maurier participating in the Hotel Astor luncheon by transatlantic telephone from London to New York. She called for writers and distributors to offset, in the literary world, the contemporary trials of civilization in the political world. ^ The Big Read, BBC, April 2003, archived from the original on 31 October 2012, retrieved 19 October 2012 . ^ W H Smith names Rebecca the nation's favourite book, The Bookseller, June 2017, archived from the original on 6 June 2017, retrieved 2 June 2017 . ^ "The Campbell Playhouse: Rebecca". Orson Welles on the Air, 1938–1946. Indiana University Bloomington. Retrieved 30 July 2018. ^ "The Campbell Playhouse". RadioGOLDINdex. Archived from the original on 6 December 2014. Retrieved 30 November 2014. ^ "Dreamworks Developing Alfred Hitchcock's Rebecca Remake". movieweb.com. 10 February 2012. Archived from the original on 4 April 2017. ^ "DreamWorks Plans Rebecca Remake", ComingSoon, archived from the original on 18 April 2012 . ^ "Rebecca", Reviews, du Maurier, archived from the original on 4 July 2008 . ^ D'Monté, Rebecca (2009). "Orign and Ownership: Film and Television Adaptations of Daphne du Maurier's Rebecca". In Carroll, Rachel (ed.). Adaptation in Contemporary Culture: Textual Infidelities. London: Continuum. ISBN 9780826424648. Archived from the original on 29 March 2018. ^ "Daphne du Maurier's Rebecca - adapted and directed by Emma Rice - a new production by Kneehigh Theatre | Kneehigh". www.kneehigh.co.uk. Archived from the original on 22 November 2015. Retrieved 21 November 2015. ^ The Times, p. 15, col A, 17 October 1983, article CS252153169 Missing or empty |title= (help). ^ a b Andriotakis, Pamela (15 December 1980). "The Real Spy's Story Reads Like Fiction and 40 Years Later Inspires a Best-Seller". People archive. Archived from the original on 10 January 2011. Retrieved 28 February 2010. ^ "KV 2/1467". The National Archives. Archived from the original on 14 April 2015. Retrieved 28 February 2010. ^ "The Key to Rebecca". Ken Follett. Archived from the original on 10 January 2013. Retrieved 28 February 2010. ^ "The English Patient – Chapter VI". Spark Notes. Archived from the original on 27 May 2010. Retrieved 28 February 2010. ^ "Manuela". Il Mondo dei doppiatori, Zona soup opera e telenovelas (in Italian). Archived from the original on 31 December 2009. Retrieved 28 February 2010. ^ "Telenovelas A–Z: Infierno en el paraíso" [Soap operas A–Z: Hell in paradise]. Univision (in Spanish). Archived from the original on 6 June 2011. Retrieved 28 February 2010. ^ House, Christian. "Daphne du Maurier always said her novel Rebecca was a study in jealousy" Archived 15 February 2018 at the Wayback Machine, The Telegraph, London, 17 August 2013. Retrieved on 6 October 2013. "Rebecca", Literapedia (book notes), Wikispaces .